Alabama's love affair with incarceration has failed from a crime-control perspective. If the purpose of prisons is to combat crime and provide for public safety then Alabama's tendency to "lock them up and let the parole board sort them out" must be viewed as a failure. While the growth in the state's incarceration rate has outpaced the nation as a whole, Alabama lags behind when it comes to reducing index crime rates. Further, a disproportionate, and growing, share of the state's correctional resources has been devoted to incarcerating people convicted of nonviolent offenses. Person offenses accounted for just a quarter of prison admissions during the last half-decade, and the proportion continues to fall as drug and property commitments grow. 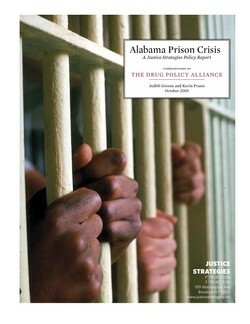 The use of incarceration for offenses that are directly tied to substance abuse contributes significantly to Alabama's overcrowding crisis. Among the ten leading commitment offenses, the top three are substance-related. Drug and alcohol offenses account for just 35 percent of all prison admissions. In 2004, more people were admitted to prison for possession of marijuana than for first- and second-degree assaults combined. While many states taken steps to reduce incarceration of substance abusers, Alabama is allowing addiction to drive prison growth. Between 1999 and 2004, commitments for drug possession and DUI shot up by 28 percent and 17 percent, respectively, while admissions for person offenses fell by 14 percent. Alabama's overuse of incarceration and attendant prison crisis stems from two flaws in the state's criminal justice system. First, the current sentencing structure exposes defendants charged with nonviolent and low-level offenses to the same long sentencing ranges as others whose crimes pose a much greater risk to public safety. The problem is compounded by harsh mandatory sentencing laws — including the state's repeat-offense statute and "drug-free zone" enhancements — that fall hardest on those convicted of nonviolent crimes. Alabama's Habitual Felony Offender Act — considered one of the toughest in the nation — exposes defendants to sentences that are up to ten times the sentences permitted for first-offenders. Under the law, an individual charged with stealing $3,000 who has one previous felony conviction faces the same harsh sentencing range, 10 to 99 years, whether the prior conviction was for marijuana possession or murder. In fact, prisoners sentenced as "habitual offenders" were twice as likely to be serving time for property offenses as person offenses. Further, wide variation in use of the statute exacerbates sentencing disparity. For example, prisoners committed from Montgomery were two times more likely to be sentenced as "habitual offenders" than those committed from Mobile. The second cause of Alabama's prison crisis is historic underinvestment in community corrections, which has left judges with few options apart from the already overburdened prison and probation systems. The state's community corrections programs have been shown to be a popular and effective way to cut criminal justice costs while improving outcomes. Despite progress made in the last few years, however, half of Alabama counties have no access to community corrections programs. An increase in state funding for the programs approved in 2005 will help to fill that gap, and should set the stage for development of a strategic plan to increase funding support to assure that every judge has effective penalty options and sufficient high-quality substance abuse treatment placements at hand when making sentencing decisions. Since the release of Alabama Prison Crisis, state lawmakers have adopted a system of voluntary sentencing standards proposed by the Alabama Sentencing Commission. Using a simulation model, the sentencing commission has predicted that the number of prisoners will stabilize at around 27,000 — creating "breathing room" that corrections officials could use to strengthen community supervision and create a more rational "punishment continuum." Meanwhile, speculators have taken matters into their own hands. Louisiana Correctional Services has built a 620-bed prison in Perry County, near Uniontown, despite the fact the DOC has declined to participate in the project. Speculative prison expansion threatens take Alabama down a dangerous and costly path. The experience of states that have allowed private and local interests to grow the prison system through the "back-door" is not a happy one. Alabama is at the crossroads in regard to the choices that face the state's policymakers. The sentencing standards enacted in 2006 provides a gateway to a more fair and equitable system for sentencing, and a more cost-effective approach to provision of correctional services. Now the state must focus on implementing the new sentencing standards and building upon them with steadily increasing investments in effective, community-based program models. The report was coauthored by Justice Strategies analysts Judy Greene and Kevin Pranis and commissioned by the Drug Policy Alliance.